What is the Maximum Amount of 99 mg Potassium Tablets to Take Daily? Potassium toxicity has serious consequences. Normal supplement doses can also cause adverse reactions. To prevent overdose, in the U.S., individual potassium tablets can have no more than 99 milligrams of the nutrient. Manufacturers give general dosage guidelines. One supplement maker suggests one 99 mg capsule up to five times daily, while another recommends one 99 milligram pill every day. Ask your doctor how many tablets your particular condition requires daily. The Food and Nutrition Board of the Institute of Medicine makes recommendations for daily potassium intake by age group. The values the organization presents include potassium you get from foods and supplements combined. Newborns to babies 6 months old need 400 milligrams of potassium from breast milk or formula every day. Older babies required 700 milligrams daily. When they turn 1 year old, children need 3,000 milligrams of potassium. That changes at the age 4 when they begin to need 3,800 milligrams of the nutrient. Children aged 9 to 13 need 4,500 milligrams. From 14 years of age through adulthood, everyone needs 4,700 milligrams of potassium daily. 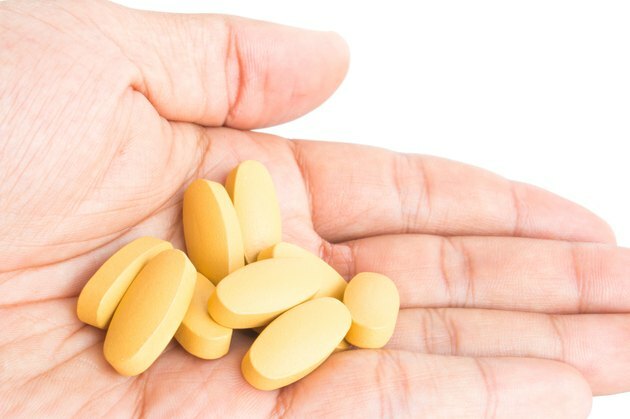 A 99 milligrams tablet falls short of these intakes, but when you add it to your total potassium intake from foods for one day, you may find the pill causes an excess. Supplementation without a mineral deficiency may raise potassium concentration in your bloodstream to a toxic level. Too much potassium, a condition known as hyperkalemia, is the most serious problem with taking potassium tablets. Other potential negative reactions not connected to excessive potassium include abdominal pain, diarrhea, vomiting and nausea. Intestinal ulcers are also possible. Hyperkalemia occurs when the amount of potassium in your bloodstream exceeds 4.8 milliequivalents per liter. If your potassium concentration rises above 6.0 milliequivalents per liter, you need urgent care. The condition causes muscle fatigue, weakness and paralysis progressively. As a result, you may also develop an abnormal heartbeat, which may lead to cardiac arrest. Taking too many potassium supplements can cause this condition, but it's unlikely to happen from eating too many potassium-rich foods. Your doctor will tell you when you need potassium supplement pills and how many tablets a day you should take. Usually, she prescribes the pill to treat a deficiency of the mineral. If you have any type of intestinal inflammation, you might not be able to extract potassium from the foods you eat. In this case, the tablets treat and prevent a deficiency.